I installed Picasa 3.9 with Wine, but I did not like it, and now I want to delete it. I tried uninstalling Picasa with the option from Picasa help menu but it didn't work. How do I fully uninstall Picasa from Wine? If the application you're trying to uninstall doesn't show up when you run wine uninstaller, proceed. Note: The following command wipes out all the programs installed in the default Wine prefix. Be advised. Since Windows programs may store data and documents on the "virtual" Windows drive contained in your .wine folder, you must make sure any valuable files are saved elsewhere first! To completely delete the Wine prefix, run the following command. The next time you run Wine, it will create a new prefix by itself. Not the answer you're looking for? Browse other questions tagged wine uninstall winetricks google-picasa or ask your own question. Does the Picasa 3.9 wine/winetricks/ie6 fix leave any vulnerabilities? 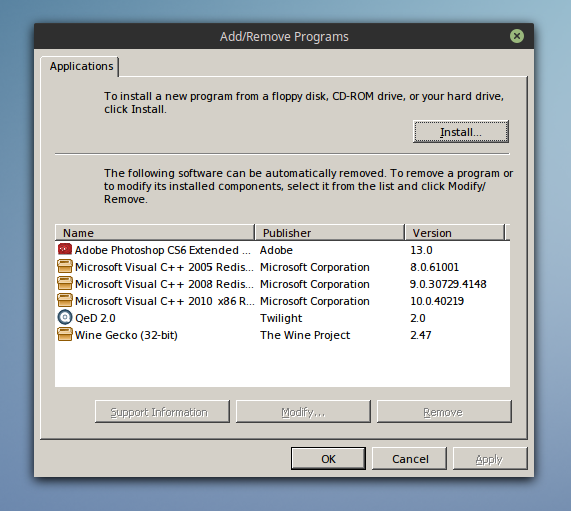 How to uninstall a program in Wine? How to uninstall a wine software? Error installing Android Studio! How to uninstall it completely?